Driven sands whipped across the arid, hard baked earth. Scorching desert winds caught up the sand and bore it aloft, whirling them in scourging blasts across the dozen ragged figures that made their way across a region where, as far as one could see, nothing lived. They walked with slow and belaboured step across terrain littered with shattered boulders and raw earth, upon which had settled coarse grains of sand. The sun broiled above, and is lash was just as cruel as the scourge of driven sand, flaying at the travellers. All about, the land shimmered in the haze of the heat, the horizon blending into the empty sky. Beset by fatigue, their shoulders slouched and heads bowed in defeat, each of the travellers knew that the end had come for them. Cruel thirst clawed at throats constricted tight and their lips were blackened and cracked. At their sides, the canteens that hung contained but a scant few drops of hoarded water, yet so dire had become their situation that those last few mouthfuls were of little aid any more. Soon their scattered bones would be bleached beneath the sun and all trace of them lost in the vast expanse of desert. Some bore wounds, recently bandaged, but few now retained any semblance of weapons or armour, it having long since been discarded as a burden too heavy to retain. More had started the trek with them beyond the dozen who remained, and horses as well, but they had fallen along the way, succumbing to wounds and heat and thirst. There had been little that their companions could do for them, and so a trail of bodies had been left in the wake of their long march. Perhaps alone, the one at the forefront of the small band still walked with a purposeful stride. Her innate vitality had not yet succumbed to the merciless assault of the inhospitable wastelands, as it had done for her companions, and nor was it in her nature to simply lie down and die. Until at last she could walk no more, she would fight to survive. Her skin had been darkened by the incessant caress of the sun, while her auburn hair was ducked away beneath a dust-stained white head scarf. At her side hung a sheathed scimitar, while a loose burnoose of pale green covered a light leather vest. Short breeches left much of her legs bare to the elements. The fires of life still burned in her amber eyes. The dozen that trod through the empty, pitiless expanse were all that remained of the once defiant rebel army of Sheik Kharjii of Abqais, a gathering of renegades who had flocked to the crimson banner of the Sheik in an attempt to overthrow the usurper, Emir Barazi. Large numbers of mercenaries had joined them as well, lured by the promise of coin and loot. Few of the mercenaries had survived the battle, whether those that had turned traitor or those that had remained loyal to the Sheik, and of those but two still remained to accompany Sheik Kharjii along the long paths into the desert. The sword-maiden Fianna of the Aedring, better known as Peregrine, and her tall, languid companion, Carse of the Red Blade, more commonly just Blade, had helped cut a path clear from the Lake of Khudir and into the hills, alongside Kharjii and two score of his best followers, men whose loyalty was without doubt and whose skill at arms unrivalled. Even with his army in ruins and his dreams as smoke, Kharjii had not abandoned hope. To the south, in the hills and deserts beyond, was Hashala where in dwelt the Hashalites, the Sons of the Desert, fell horsemen whose skill with the bow was feared by all who crossed them. Many were sympathetic to his cause, having suffered at the iron fisted hand of Barazi and his men. That hope had been in vain, for Barazi had proved more cunning, and more ruthless than they had ever expected. He had sent a force of horsemen on ahead even while he routed the army at the Lake of Khudir, and these had descended upon the Hashalite tribes, wiping many of them out. All that Kharjii found as he pushed through the hills and into the deserts were burnt out camps populated by the bodies of the dead, young and old, men woman and children butchered indiscriminately. With no recourse but to seek refuge in neighbouring lands, they had attempted to find a way, but Barazi’s men had hounded them, driving them deeper into the deserts with each step. Barazi had but one aim; to destroy Kharjii and his rebellion utterly, in such a manner that none would dare rise against him every again. As so, one by one, the horses and many of Kharjii’s men had fallen along the murderous trek they had been forced into, until only the dozen remained, and those had been reduced to shattered men, weakened by wounds, despair, the lack of sleep and a lack of water. Kharjii, a man tall and hawk faced, with a rather pointed blue-black beard, typical of a man of the Ishmarites of the southern region of the Swordlands and who were kin to the Hashalites, came to a stop as he peered across the merciless lands before him. From one of the trailing men, a sudden rasping cry arose. One hand shaded his eyes from the blinding sun while the other pointed out across the shimmering, heat drenched lands of stone strewn barrens, off towards the south and east. Among the rippling haze, barely seen upon the horizon, they could just make out what appeared to be a trio of spires. Whether natural or crafted the distance remained too far to make out. They stared as best they could towards it, trying to bore through the haze that obscured the horizon, until at last Kharjii spoke up. “It is but a mirage, such as we have seen before, no doubt.” The heat and thirst that plagued them had also played cruel tricks upon their senses before, and with each their hopes had been cruelly dashed. The pronouncement saw a ripple of concern run through the gathered men, even fatigued as they were. Few had no heard tales of Al-Aria, a place of dread and dark shadows. Many had sought it out, and the riches that it was said to contain, and seldom had any of them returned from it, and fewer still of those returned sound of mind. The pitiless Baktheri, long dead, had earned a reputation for capriciousness, and extreme cruelty learned as slaves at the feet of the ancient, inhuman Xoacana. First among the human nations to have rise, they had in turn enslaved their fellow men in the earliest days, before their demise. “A Baktheri city is not a place that one treads lightly in,” Kharjii stated. All of the small, bedraggled band turned to look off to where she gestured, and to the north, from whence they had come, they could make out a cloud of dust heavy upon the horizon, within which appeared a band of horsemen who were following their trail. 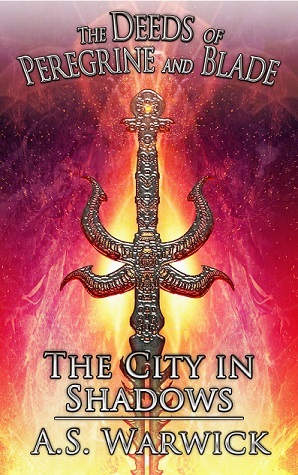 With purpose renewed, they quickened their pace once more, making for the shimmering spires of the city that had appeared before them from out of the desert, determined to face bravely whatever darkness it held.